Joe Russell and Jonathan Jacobs at MRIGlobal have been designing and building modular systems for real-time, point-of-care molecular microbiology. Recently developed molecular analysis platforms offer the promise of bringing comprehensive detection, diagnostics, and biosurveillance of emerging infectious diseases to extremely remote and austere locations, completely detached from a traditional brick and mortar laboratory. MRIGlobal’s poster presentation detailing the Mercury Lab Technology in collaboration with Biomeme. Joe and Jonathan recently field tested one of their “Mercury Lab” prototypes in the first demonstration, to our knowledge, of direct, non-PCR-based, metatranscriptomic detection of an RNA virus from mosquitoes using nanopore sequencing. This work shows the feasibility of a backpack-enabled workflow for field-able, genomics-based biosurveillance. Read more about the Mercury Lab on MRIGlobal’s poster presentation. 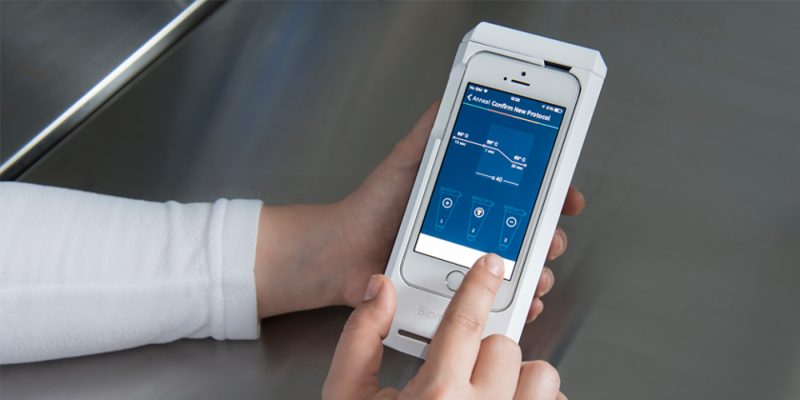 Biomeme’s two3 mobile handheld qPCR machine and the MinION from Oxford Nanopore Technologies offer target amplification and long-read sequencing capability, respectively, in an ultracompact form factor that is amenable to transport and use by a single operator. Additionally, Biomeme offers nucleic acid extraction kits that can be adapted to different matrices, do not require pipettes, and can be completed in just a few minutes. 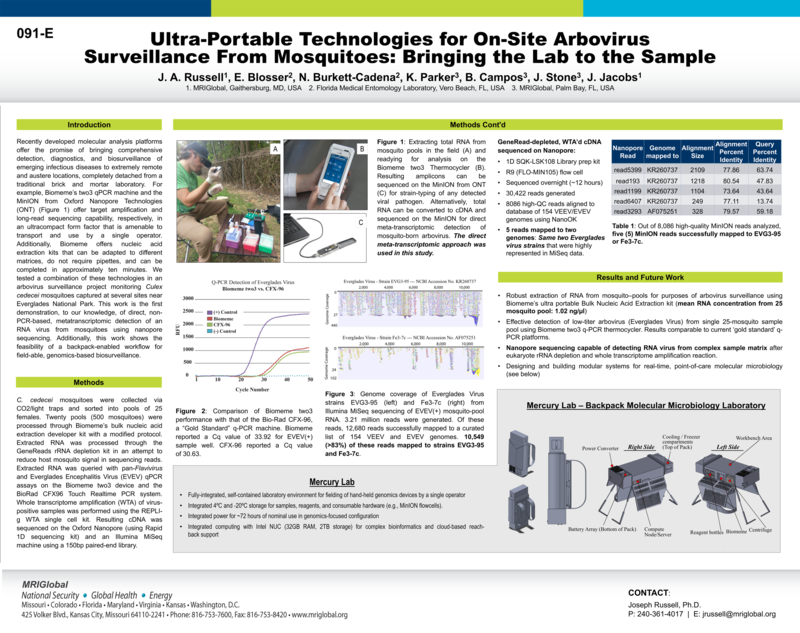 Robust extraction of RNA from mosquito pools for purposes of arbovirus surveillance using Biomeme’s ultra portable Bulk Nucleic Acid Extraction kit (mean RNA concentration from 25 mosquito pool: 1.02 ng/μl). Effective detection of low-titer arbovirus (Everglades Virus) from single 25-mosquito sample pool using Biomeme two3 qPCR thermocycler. Results comparable to current ‘gold standard’ qPCR platforms. Nanopore sequencing capable of detecting RNA virus from complex sample matrix after eukaryote rRNA depletion and whole transcriptome amplification reaction. We are excited to announce that this work has been featured in the GenomeWeb article, “MRIGlobal Demonstrates Nanopore Sequencing in the Field in Step Toward ‘Lab-in-a-Backpack'” by Monica Heger. GenomeWeb is an independent online news organization the serves the global community of scientists, technology professionals, and executives who use and develop the latest advanced tools in molecular biology research and molecular diagnostics.